You know you’ve made it when Madame Tussauds carves your likeness in wax. Even when the infamous wax studio makes Zac Efron look like Adam Levine or causes internet outrage with their poor Lady Gaga figurine — if you have a wax figure made in your image, it means you matter in pop culture. Meghan Markle just joined the wax figure club today, May 9th, with her and Prince Harry’s royal couple wax reveal. Madame Tussaud added a beard to the Harry figurine they already had at their London location and created a brand new Meghan statue. Harry is wearing a navy suit and Meghan is dressed in a green P.A.R.O.S.H. dress, which are the same outfits the couple wore at their engagement announcement. Meghan’s wax figure even has a replica engagement ring. If you can’t make it to the royal wedding (wait, if you are attending, who are you and how did you manage that? ), you can celebrate the spirit of the day by heading to Madame Tussauds London on May 19th, 2018, the same day as the royal wedding, and check out “Their Royal Likenesses.” In other words, Meghan’s wax statue joins the royal family portion of Madame Tussauds London and will be on display beginning May 19th, 2018. "There is a lot of love out there for Meghan and Harry and we're following their lead by inviting the great British public to join the couple in their wedding celebrations here at Madame Tussauds London," Edward Fuller, general manager at Madame Tussauds London, revealed in a statement (via BBC.com). 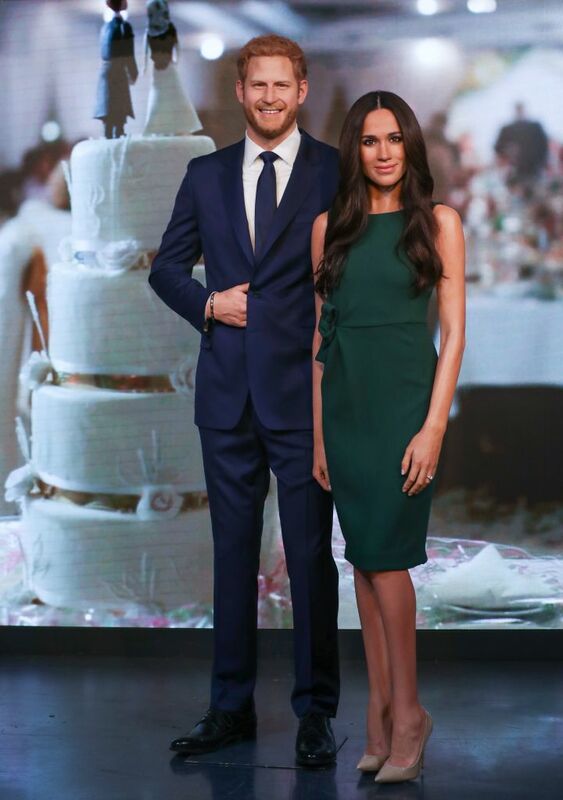 Normally wax figures give us the creeps, but is it just us or do wax Harry and Meghan look like a cute couple? The likeness is eerily spot-on, no?